Strong as steel, very low stretch and so light that it floats. 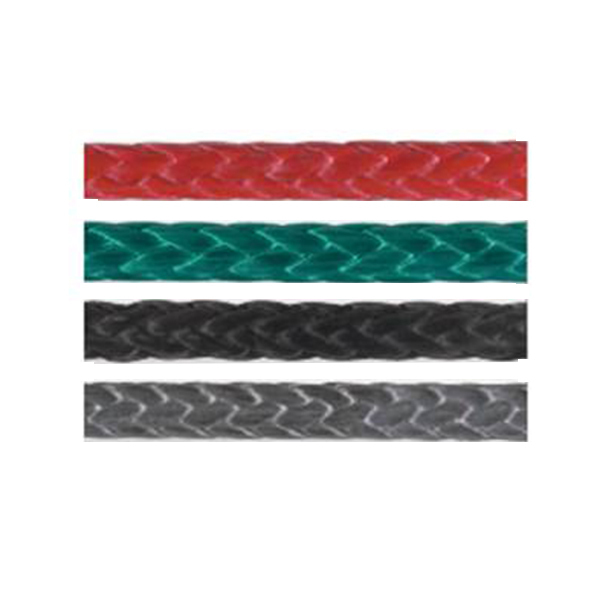 With enhanced creep performance for superior resistance to stretching over time, AS-78 incorporates high-performance Dyneema SK-78 into a 12-strand single braid line. Dyneema SK-78 fiber has one of the highest strength-to-weight ratios of all the high-modulus fibers. Very high strength, 30 - 40% lighter than Aramid ropes of the same strength, is matched with very low weight, and it floats. Its extremely low elongation and outstanding creep performance are matched by excellent flex-fatigue performance and abrasion resistance. It offers the racing community the next generation in high-performance lines and is the same price as Samson's SK-75 single braid. Coated with Samson's proprietary Samthane coating. Core fiber: Dyneema® is a brand of UHMWPE (Ultra High Molecular Weight PolyEthylene fiber) from the Dutch company DSM Dyneema. It is a long chain, oriented strand synthetic fiber with very high strength as well as high abrasion resistance, also known as HMPE (High Modulus PolyEthylene). Dyneema rope is made in a number of formulations, SK-60, SK-75, SK-78, SK-90, etc. Each is progressively stronger and more costly. Honeywell International makes a similar UHMWPE fiber, called Spectra®. Hand/Feel: Very slippery so is often used with modern sheaveless blocks and thimbles. Not good at holding knots but easily spliceable with a 12-strand eye splice. Must be covered with a heat-resistant jacket where it wraps around highly-loaded winches.